Shuguro Nakazato began his training in Karate in 1935. At the same time, he also started training in the art of kobudo (“ancient martial way”) which is the Okinawa indigenous art of weaponry. His sensei, until the start of WWII, was Seiro Tonaki. After the war Sensei Nakazato returned and trained under Seiro Tonaki's teacher Masami Chinen. Sensei Tonaki and Sensei Chinen were both students of Sanda Chinen (Yamane). After Sanda Chinen's death, Masami Chinen named his style Yamane-Ryu in honor of his father. Sanda Chine in turn learned Bo-Jitsu or, “the art of the bo,” from his father Chinen Peichin. Chinen Peichin was a student of Tode Sakagawa. A parallel line in our kobudo linage comes from Kenko Nakaima who, in 1970, named his secret family fighting style Ryuei-Ryu and started training non family members. 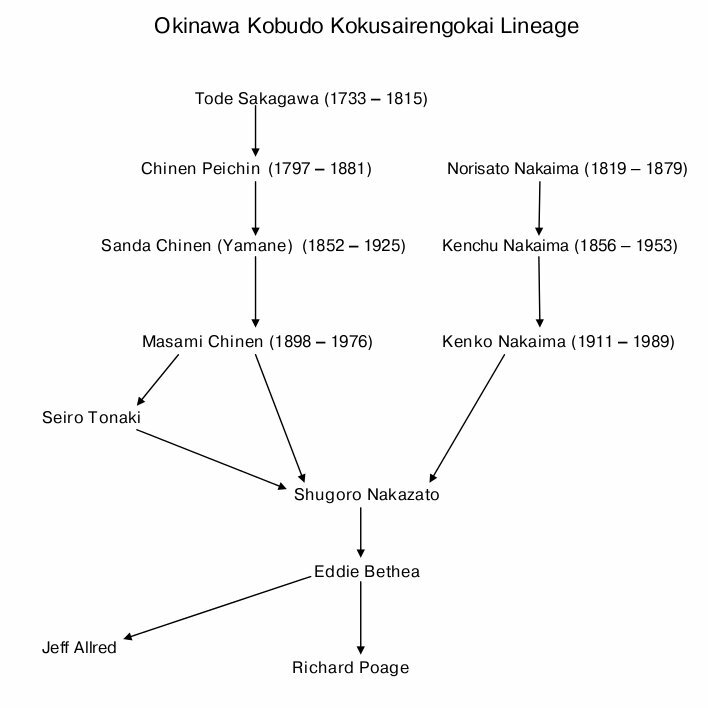 The Nakaima family lineage goes back through Sensei Nakaima's father, Kenchu Nakaima and his father, Norisato Nakaima. Norisato Nakaima learned martial arts during his stay in China. 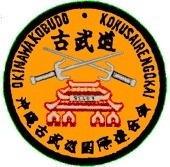 Many people in our dojo and in our kobudo style the “Kokusaireingokai” call the kobudo kata by shortened names or nicknames like “Bo Dai Ichi” which means, “bo number one,” or “Shushi No Kon,” which means “Shushi's bo.” However if you learn formal names of all the kobudo kata such as, “Yamane No Bo Shushi No Kon” it becomes easy to see where each kata came from. In this case it camp from Yamane Tanmei also known as Sanda Chinen.